This room is one of the finest specimens in this selection of living rooms, with luxurious interiors and a stylish selection of furniture. The living room is marked by the flourishing brown expanse of the wooden panels, which are in perfect harmony with the rest of the wooden furniture in the living space. The pristine white sofa sets are set against a cream backdrop, with identical table lamps adorning the brown oak wood tables. The sofa sets stand on wooden legs that line the length and breadth of them. 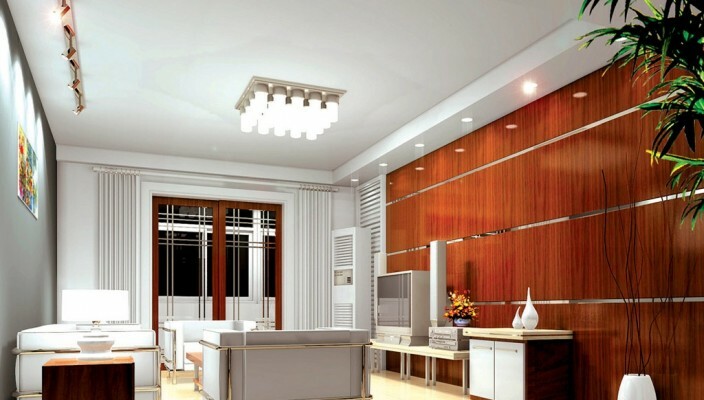 The flooring is comprised of pale wood with a high quality finish that enhances the chic grandeur of the room. The master doorway in the room is a futuristic expression of glass and wood, with geometric patterning across the glass panel, overlooking a white and black corridor outside. The small, colourful painting on the white wall in myriad hues lends the room the much-needed want for colour.